We had a very tiring first day of the 2010 South Beach Wine & Food Festival, perhaps from too many spirits during the Trade Tasting. Its difficult to say no to premium rum, vodka, and VEEV acai - not even mentioning the abundant still and sparkling wines. We saved those for Best of the Best and for Day 2. And speaking of the Best of the Best - the food and wine was unbelievable. I spent the evening tasting Burgundy and Russian River Valley Pinot Noir and Monica, she stuck to the sparkling wine. Even though the event was dominated by big name Napa wineries, there is defiantly an abundance of excellent Pinot Noir. Pali Wine Company, A. P. Vin, Hanzell Vineyards, and Roessler Cellars; top flight wineries making excellent wines. A couple other mentionable wines we tasted was Sicily Nero d'Avola from Planeta and Petite Syrah from Chiarello Family Vineyards. Today we will be spending a lot of time with the students of the Florida International University's School of Hospitality and Tourism Management, and then, plan on discussing bio-dynamic wines with Paul Dolan. In the evening, we will be attending the Seven Daughters SOBE Soundcheck. We returned to Cenan's Bakery in order to see what other offerings from Kavaklidere Winery the bakery offered and purchased a white and red - the Çankaya and Selection Öküzgözü-Boğazkere. The first is apparently the most popular white wine in Turkey and is made from the indigenous Narince, Emir, and Sultaniye grapes. This is a classic European wine - the fruitiness is not overwhelming and the wine has plenty of mineral content. This is simply and excellent choice for everyday white wine. Highly recommended. The Selection Öküzgözü-Boğazkere is obviously a blend of these domestic grapes and is one of the premier offerings from the winery. The wine was first produced in 1987 to honor the 60th anniversary of the winery. The grapes are selected from the finest vineyards in Eastern Anatolia and after fermenting, aged 12 months in French Oak. The result is a full bodied wine - much fuller than the Yakut Kavaklidere Oküzgözü - but extremely smooth at the tail. There is really no need to age this wine to loosen the tannins. We served this wine to house guests who were not only surprised to try a Turkish wine, but also on the quality. These wines will not doubt become staples in our cellar. For the past nine years we have been entering our favorite bakery, Cenan's, and past right by their wine rack since our preferred wine shop is located in the same shopping center. 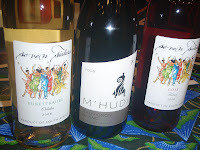 However, last week while waiting for our our, I browsed through and found a few Turkish wines made by Kavaklıdere Winery. Now it shouldn't be a surprise that wine is made in Eastern Anatolia since grapes have been planted in that region from 4,000 B.C.. And even with the current political and religious culture in the Middle East, wine making is still relatively prevalent. Kavaklıdere Winery, was the first private sector wine producer in Turkey, having been established in 1929 in Ankara. Most of their wines are made from grapes indigenous to the regions - with a few "Western" varieties mixed in. Turkish Yakut wine is a blend of Öküzgözü, Boğazkere, Carignan, and Alicante and the version I purchased is primarily Öküzgözü. According to their site, "The Oküzgözü grape is part of the native Turkish red grape prolific around the mountainous Elazig region in eastern Turkey. The area is perfect for growing this type of grape thanks to its proximity to the Euphrates River, which helps to moderate the usually severe climate typical of this area. Öküzgözü, which literally translates as ‘ox eye’ are perfectly round, dark red grapes, which produce excellent dry red wine with a propensity to age well up to 10 years." The Yakut Kavaklidere Oküzgözü wine was a nice discovery. It is a very drinkable everyday table wine: medium bodied, with light tannins. It is produced to consume now - and thus we did. An added bonus is that it retails just over $10. We will be back to Cenan's Bakery to try their other Turkish brands. Wines from Spain with Doug Frost M.S., M.W. - Far from Ordinary! South Beach Diet presents Fun & Fit as a Family featuring Kellogg's Kidz Kitchen. We are particularly looking forward to catching up with Doug Frost and his Wines of Spain seminar will be more than entertaining. We also hope to catch Guy Fieri again either at the Kellogg's Kidz Kitchen or at an after hours party. Then there's Kevin Zraly, Ludovic Dervin - Mumm Napa, Jim Clendenen - Au Bon Climat, and other wine personalities, who we hope to run into and ask a few questions. Finally, although we live 45 minutes from the Ace of Cakes bakery, this may be the closest we ever get to Chef Duff. We will see what Baltimore area breweries he frequents the most. Check back often over the weekend or on our twitter and facebook feeds for updates. Saturday the 13th, we attended the 11th Annual International Wine & Food Festival held at the Ronald Reagan Building and International Trade Center and quite frankly it was a it disappointed. The primary deficiency was that there was not nearly as many participants as previous years; there was so much open space where wine vendors should have been. I guess the economy has taken its toll. The main attraction were wines from the Kingdom of Navarre and while decent, they weren't anything to knock your socks off. Their best quality was their affordability - most brands were under $15. 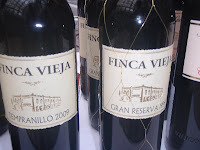 In contrast there was one Spanish collection that peaked our interest - the wines from Galicia. Both the red and white wines from this region had character - probably because winegrowers there were still using mostly indigenous grapes in which history has suggested flourish in that geography. In particular the Coto de Gomariz have been in the forefront using these indigenous grapes, most which we had never heard of. Yes, of course, Albarino; but not, Treixadura, Loureira, Godello and Sousón, Ferrol, Mencía, Brancellao and Caiño Longo. We were most intriqued with Treixadura - both in blends and as a 100% varietal. For reds, the Cuvée Primo - a blend of Sousón and Caiño Longo - was very nice. Wines from Galicia will be on our horizon for quite sometime. As in years past, the festival included wines from Maryland, Virginia, and New York through the Monticello Wine Trail, DC Wine Country, Maryland Wine, and Finger Lakes Wine Country.We didn't spend to much time sampling their products since we regularly have chances. However, what is notable is that this year saw a larger contingent of Maryland wineries and the promotion of several new wine trails: Chesapeake Wine Trail , Patuxent Wine Trail, and Piedmont Wine Trail. 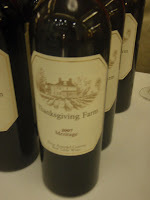 The proprietors of Thanksgiving Farm were on hand pouring their excellent Meritage as well as wines from Bordeleau Winery. Bordeaux wine styles were also available through Black Ankle Vineyards and a couple from Elk Run Vineyards. 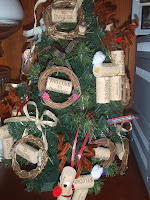 The former is one of our favorite Maryland wineries - they provide great wine and music. There were a few California wineries in attendance, but the main focus was on international producers. the Côtes-du-Rhône graced us with their presence once again and we sampled several affordable Syrah, Grenache, Cinsault, and Mourvedre blends. Love these grapes. France was also represented by Alsace Wines; although known for their Reisling, Gewurztraminer, Pinot Gris, our favorites were their Pinot Blanc - the Dopff & Irion and Jean Baptiste Adam. In years past, there would be several eastern Europe wineries, but this year the sole brand was Alana-Tokaj from Hungary. They of course were pouring some Tokaji Aszú and similar late harvest wine made from Furmint, but I've always liked the dry Furmint by itself. They also were pouring a dry Hárslevelü which was nice. We tried several New Zealand Sauvignon Blanc and Pinot Noir which were quite nice. Tarras Vineyard poured two Pinot Noirs which were completely different even though the vineyard was the same. They showed the difference that just one year can have on the grape's character. Oyster Bay also poured an excellent Pinot Noir as well as Sauvignon Blanc and a Chardonnay. The Sauvignon Blanc was not your standard version - it had a mid palette not just the typical grapefruit acidic explosion at the first sip. Finally, we learned about the International Society of Africans in Wine which sells South African wine owned and operated by black South Africans. The organization will return to Washington D.C. on May 14th and 15th for their "Drink Well, Do Good" tour. Dates for other cities are available on their website. Looking forward to tasting wine made from the Bukettraube grape. Usually this festival provides a few beers or spirits, but this year saw just one entry - Philadelphia Distilling. I'm glad they came - their appearance made our visit. Master Distiller Robert John Cassell crafts three spirits: Penn 1681 Rye Vodka, Bluecoat American Dry Gin, and Vieux Carre Absinthe. 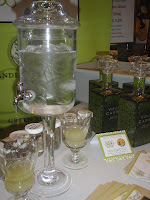 Now, we have never been fans of absinthe - although we love the paraphernalia associated with dispensing the beverage. However, their vodka and gin are outstanding. Funny how we can drink practically anything, but like absinthe, gin is usually not in that list. There are always a few that force us to adjust our preferences and the Bluecoat American Dry Gin is one of these. It's probably the citrus peels that are added to the juniper berries and the other organic botanicals. Or maybe that it is distilled five times in a custom-built, hand-hammered copper pot still. Whatever, this gin is excellent neat or with the grapefruit juice - as they were providing this day. Their vodka is even better. It may be the first we tasted using rye and distilled four times using a column still. But what makes it so smooth - absolutely zero burn must be the charcoal filtering. Penn 1681 Rye Vodka may have supplanted Maine's Cold River Vodka as our favorite American vodka. Discovering the wines from Galicia and tasting the spirits from Philadelphia Distilling made it worth attending this event - even with the reduced number of wineries pouring. Let's hope next year is back to normal. the The Ronald Reagan Building and International Trade Center. It looks like the tasting theme revolves around Spanish wines. You can also always count on local wines from Maryland, Virginia, and the Finger Lakes. La Face Cachee de la Pomme Inc. According to the Baltimore Sun, Maryland wine consumers' ability to purchase wine online is still being held hostage by state officials. This time the culprit is State Senator Joan Carter Conway, a Baltimore Democrat and chairwoman of the Education, Health and Environmental Affairs Committee. She claims to be an advocate of prohibiting underage drinking: "Her chief concern, she said, is that underage drinkers will tap the Internet for wine. There's no way, she said, to force delivery agencies, whether the U.S. Postal Service or a private carrier, to verify the age of the person accepting a package." Well, if that is the case, how am I able to order wine online while living in neighboring Virginia and have the delivery company check my ID upon delivery. Her statement is quite laughable. On a saner note, Sen. Jamie Raskin, a Montgomery County Democrat and proponent of "Free the Grapes", states that he has not heard "any convincing argument against the wine bill. It's working in other states. It can work here, too." Of course it can. Here's a suggestion if you still can't conceive of wineries shipping directly to individuals. Have consumers order the wine and have it delivered to a local wine shop. The wine shop can collect taxes and ID the purchaser. Problem solved. Benches on Parade is a summer-long community arts project that showcases local creativity and civic pride while helping raise funds for local not-for-profits presented by Nazareth College and produced by Dixon Schwabl. Heron Hill Winery is proud to sponsor the largest bench that will be painted by internationally renowned artist Philip Burke who will be painting local musician Chuck Mangione onto a bench! Burke’s vivid caricatures have adorned the pages of Rolling Stone magazine for more than a decade. His style is unmatched; explosive use of color, sparing brush strokes and distorted renditions of his subjects. The benches will be displayed all across the Greater Rochester and Finger Lakes area starting in May and at the end of the summer, the benches will be auctioned off to the highest bidder. A portion of the auction proceeds will benefit Nazareth College Arts Center, Rochester City Ballet, the New York Wine & Culinary Center and an additional non-profit of the high-bidder’s choice. Heron Hill Winery has generously donated to over 50 great causes and organizations including: Ducks Unlimited, Palate Press Wine Auction for Haiti, Camp Good Days, Golisano Children’s Hospital, PBS, Tanglewood Nature Center, Breast Cancer Coalition of Rochester, Relay for Life, Historical Society, Red Cross, Juvenile Diabetes Foundation, United Way, SPCA, March of Dimes and Museum of Natural History. For more information about Heron Hill Winery, one of Travel & Leisure’s ten most spectacular tasting rooms, visit www.heronhill.com. Food Network seeks budding restaurateurs in DC! I am the casting producer for 24 Hour Restaurant Battle, Food Network’s new restaurant competition series from the producers of The Next Food Network Star. We're currently casting the very first season and would like to inform you and your readers that we're holding an open casting call in Washington, DC on Monday, February 22, 2010. * Two to five person teams with pre-existing relationships (brother and sister, mother and son, husband and wife, etc.) who would love the chance to prove that they can run a restaurant. * A dynamic front of house and back of house duo. One person on the team will run the front of the house and the other person on the team will be the chef and run the kitchen. All levels of experience (culinary school trained to home cook, little or no restaurant experience to a lifelong career in restaurants) will be considered. * Lots of energy and charisma! We're seeking personalities that pop. If you have any questions or need further information, please feel free to contact me or visit our website at www.24hourrestaurantbattle.com. After some winter hibernation, we finally ventured outside our domain and visited the latest, and closest, winery - Paradise Springs Winery. Located in historic Clifton, Virginia; this establishment is about 20 minutes, without traffic, from the Capital Beltway. Jane Kincheloe and her son Kirk Wiles have been planning its conception for the past 20 years and with the help of established wineries - crushed their first grapes (Sauvignon Blanc) in 2007. Fortunately, Winery at La Grange has additional capacity and will be used until their barn can be converted into a production facility. The barn has an interesting history. 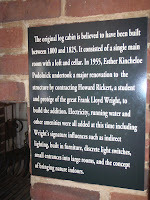 It was formerly located in the town of Fairfax, but in 1956, it "was taken apart, individually numbered, and reassembled piece by piece on the property". 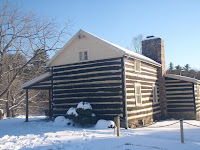 Not to be out done, the tasting room is located in a log cabin that was originally built between 1800 and 1825 and then renovated in 1955 by a protege of Frank Lloyd Wright. 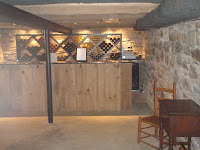 When you visit, spend a few minutes in the wine cellar - its re mindful of the European wine caves. While planning their opening, Paradise Springs benefited from the camaraderie among Virginia winemakers. Its interesting to learn how other winemakers and growers continue to assist each other in the state. Sure there's competition, but simultaneously plenty of support. And Paradise Springs received plenty from the proprietors at Philip Carter Winery of Virginia, Pearmund Cellars, Winery at La Grange, and Corcoran Vineyards - among others. However, there has been several setbacks along the way - and even more than the standard start-up issues. 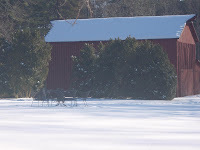 Their neighbors were not keen to a farm winery in the area and fought its establishment through the county government. Fortunately the County Supervisors were more sympathetic to their cause, as were the retail owners in downtown Clifton. Fortunately they did not have to experience the painful legal battles as Marterella Winery. Hopefully these troubles are behind them and their neighbors will warm to the idea of a tasting room nearby. I know I would. For our visit today, Paradise Springs had a wide array of wines and styles waiting for us. We started with their Sauvignon Blanc which was a nice surprise. I've found that east coast versions have been extremely light and flavorless, but this was an exception. It was full of grapefruit flavor and had nice acidity - a good start to the tasting. Their Chardonnay is made in the sur lie style and aged nine months in French oak. The result is a another flavorful wine with a buttery finish. Paradise Springs couldn't be a Virginia winery without producing a Viognier and their version is okay; our apathy may result from the high standards that Virginia has established with this varietal. There is stiff competition for Viognier. Their most interesting wine is their "kitchen sink" Vidal Blanc - composed of 75% vidal and 10% Traminette, 7.5% Viognier, 5% Petit Manseng, and 2.5% Chardonnay. This is a fun wine - fuller than your average vidal with lots of balancing flavor. And even made with 1.1% r.s. - it felt like a dry wine. Turning towards their reds, we started with their strawberry bomb, Nana's Rosé - a dry rosé blend made from equal parts Merlot and Tannat. I say strawberry bomb because this wine is all strawberry, from the nose to an unexpected explosion of berry flavor. I really liked it, however, I overheard another taster exclaim there was too much strawberry. That's why you need to taste and trust your own palate. Next was the 2007 Reserve Cabernet Sauvignon, recently awarded a Silver medal in the state Governors Cup. This wine was aged 13 month and should age nicely with the string tannins. We have long dismissed Virginia made Cabernet Sauvignon - but times are a changing. With Keswick Vineyards version that was awarded the Governors Cup last year and others, including this version, its time to start taking Virginia produced cab more seriously. The other cab, Cabernet Franc, has no problems gaining credibility in the state and Paradise Springs produces is a nice medium bodied version. It has strong cherry flavors and a easy finish - making it drinkable now. The final wine was a 2008 Norton made from grapes sourced, not surprisingly, from the word's largest grower of Norton: Chrysalis Vineyards. The wine is aged six months in Hungarian Oak and they did a remarkable job removing the inherent acidity and grapey flavor that make poorly made Norton quite toxic. This is much better than many of the Norton's produced by established Virginia wineries and should even get better with another year or so to mellow in the bottle. Don't expect a 2009 Norton, because the grapes were damaged by uncooperative weather. Despite problems with their neighbors, Paradise Springs is a welcome addition to the Virginia wine family. Its a nice attraction close to the Beltway so there's no need to journey too far out Route 66 for a quick indulgence. They can expect us to return quite often.